Dr. Seawright is involved in ongoing research projects about multi-method research designs for causal inference; about the link between class and gender inequality and unequal political representation; and about how dynamics of political psychology and organization shape party-system change. 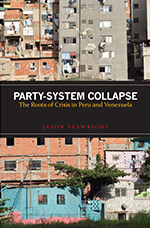 He has a special research interest in the politics of the Andean countries of South America. “Rival Strategies of Validation: Tools for Evaluating Measures of Democracy” with David Collier. Comparative Political Studies 47 (1), Jan. 2014: 111-38. “Democracy and the Policy Preferences of Wealthy Americans” with Benjamin I. Page and Larry M. Bartels. Perspectives on Politics, 2013. “Do Electoral Laws Affect Women’s Representation?” with Andrew Roberts and Jennifer Cyr. Comparative Political Studies, 2013. “Regression-Based Inference: A Case Study in Failed Causal Assessment.” In Rethinking Social Inquiry: Diverse Tools, Shared Standards, 2nd edition, Henry E. Brady and David Collier, eds. Lanham: Rowman and Littlefield. 2010: 247-71. “Political Representation and Class Distortion: The Nexus between Associational Participation and Partisan Politics,” in Ruth Berins Collier and Samuel P. Handlin, eds., Popular Participation and Interest Regimes in Latin America: From Union-Party Hub to Associational Network (University Park: Penn State University Press), 2009. “Case-Selection Techniques in Case Study Research: A Menu of Qualitative and Quantitative Options,” with John Gerring, Political Research Quarterly 61:2 Spring 2008, 294-308.